Energy, particularly electrical energy, which is the foundation of modern technology, plays a role in our culture today that cannot be ignored. But what actually is energy? Does the history of energy start with Edison’s discovery of the light bulb and has it reached its peak with atomic energy, laser beams and ultrasound? Or, considered from another angle: is this, which generally is regarded as the highest level of technical development, just a mechanical, coarse, rather limited, and almost primitive way of utilising energy? If you examine the ancient cultures on all continents, there can be found traces of knowledge and use of biological, cosmic or psychic energy – or whatever one wishes to call this energy. In this article, I will cover various approaches. The interest for exploring psychic energy, the life energy which is at the disposal of every human being, can also be traced back through European history. It is important to note that here, we are not dealing with philosophic considerations, but practical methods, which, for instance, were used for healing. The alchemist, physicist, doctor and ‘miracle-man’ from the Renaissance, Paracelsus (ca. 1493 – 1541), called it Munis. He discovered that this energy can cleanse the body and restore health, and that blockages or a weak energy field can cause illness. In his time, Paracelsus achieved great success with healing. However, his unconventional methods were not in accordance with the ruling medical practice, and he was excluded from the medical association. Nowadays, however, Paracelsus is considered one of the greats of his time. In the 17th century, in the neighbouring country of Belgium, the chemist and physicist Val Helmont (1580 – 1644) was the originator of the concept Magnale Magnum. He was convinced that through this energy one could influence or heal another human being, even at a distance. Also the renowned German chemist Baron von Reichenbach (1788 – 1869) worked with a similar energy model; he named it Odic Energy. The German researcher Franz Anton Mesmer (1734 – 1815), developed the concept Animal Magnetism: he channelled his patients’ energy with his hands. Today, so-called Magnethopaths, whose treatment is based on his teachings, still practise. Mesmer did not succeed in justifying his Animal Magnetism to the medical association and was also ostracised. In the 20th century, the Austrian psychotherapist Wilhelm Reich (1897 – 1957) applied in his therapy, the concept: Orgon Energy. He ascertained that tensions and blockages in the energy field of the body manifest themselves as psychological disturbances, and that the psyche, in the same manner, influences the energy. Reich applied certain exercises of which many resemble yoga poses to recreate a free flow of energy. Reich’s ideas today form the basis of certain psychotherapies. One of the most well-known students of Sigmund Freud, he was subject to persecution from Hitler. It should be noted, however, that after emigrating to the USA, he spent the last years of his life in prison there, having been convicted of spreading ‘anti-establishment ideologies’ during the McCarthy régime. The foregoing represents only a selection of the more well-known names, theories and concepts. The real list is much longer. No matter whether it is called Vital Energy, Munis or Orgone, the names stand for the same thing: a subtle energy which is behind and influences the physical body. One can wonder why so many different names for this energy emerge just to sink into oblivion again. None of these pioneers succeeded in establishing their theories as an ‘official’ science. Most were forced to perform their research secretly, and some were pursued even to their death. Their work was grouped together with superstition and quackery. Already around the year 400, the activities of the Gnostics, who among other things used the chakras, were forbidden. Esoteric knowledge hereafter, and up to our time, was only used in secret circles, lodges or among the alchemists. The psychiatrist Carl G. Jung, for example, had contact with such a society. But why were these people rejected to such an extent and their ideas met with intolerance in the culture of the past? Apparently, it was taboo to deal with psychic energy, an almost neurotic fear of the unknown. What is not explicable by the currently acceptable means and available concepts, evidently cannot be. This limitation, though, originates solely within the materialistic way of thinking and conceptualising. It is not the case all over the world. Other cultures (which I will deal with later) have integrated the use of psychic energy into daily life. But first, let us look into a more recent scientific view. In the late 1920’s in Russia, there was a strong interest in the exploration of psychic energy and so-called paranormal abilities (telepathy at greater distances, motion of objects with the help of will power etc.). Various research teams – physicists, mathematicians, biologists and psychologists – received generous financial support from the state, and laboratories well-fitted with electronic measuring equipment were placed at their disposal. In comprehensive investigations lasting several years, they were able to make ‘non-mechanical’ energy tangible and document their findings. The scientists agreed that they had discovered a revolutionary form of energy, an energy field or body available to every one. In the book Psychic Discoveries behind The Iron Curtain, 1973, the Americans, Ostrander and Schroeder, published the most interesting and spectacular results of these investigations. Of course, the researchers in the East did not invent this energy – their discoveries, however, identified what has been handed down over the centuries in many traditions. The merit of their work lies in demystifying the concept of energy and formulating it into words which can be understood from a technical-scientific world view. Kirlian photography – a bridge to the present? The development of kirlian photography since 1939, is one of the fruits of the work in Russia. It is a type of photography in which the energy field of human beings, animals and living plants can be seen as coloured rays of light on a picture or a screen – and here, we are not talking about heat radiation. An example from the experiments: A healthy leaf is ‘photographed’, and the energy field becomes visible – as a contour consisting of rays of light in all directions around the leaf. Then a third of the leaf is cut off. The photography is repeated, with the result that the energy field of the whole leaf is still present – with the same form and size as on the first picture. Not until more than a third is removed, does the leaf ‘die’, and the energy body disappears. ” All activity in the inner life of human beings is written down in light-hieroglyphs…“(Seymon Kirlian, inventor of kirlian photography). By means of kirlian photography, it is possible to see holes in specific parts of the energy body/field and by that, make a diagnosis of particular illnesses. When different states that originate from emotions and thoughts are compared with states arising in meditation and relaxation, one can visually register changes in the energy field. The knowledge of a psychic energy, which can be mastered, a life energy or cosmic energy, of which human beings form a part, is firmly rooted in many ancient traditions or cultures. In China, the energy is called Chi and in Polynesia, Mana. In India – a country which has at all times tolerated and respected people working with themselves and seeking the spiritual dimension of life – Prana is spoken of. In recent years, the interest in aboriginal cultures has grown in the West. One should, however, beware of the misunderstanding that this is about exotic philosophies which have to be learnt by rote, or which one has to believe in. These are not theoretical concepts, but, first and foremost, practical methods one can use to maintain physical and mental health and develop spiritually. For centuries, they have been handed down unchanged. Today, we have the possibility of benefiting from this knowledge. In the Chinese and Japanese tradition, healing systems such as Acupuncture and Shiatsu are found. They are based on a precisely mapped network of energy currents (Meridians), in which the life energy, Chi or Ki, is flowing. Simplified, one can say, that an imperfect distribution of energy is corrected by stimulating certain energy points. In this manner, causes of illness and pain are removed. Treatment entails point massage or insertion of needles. Even though the prevailing explanations of the school of medicine are inadequate, no genuine doctor any longer disputes the efficacy of these methods. Prana is the name in the Indian tradition for the cosmic life energy. 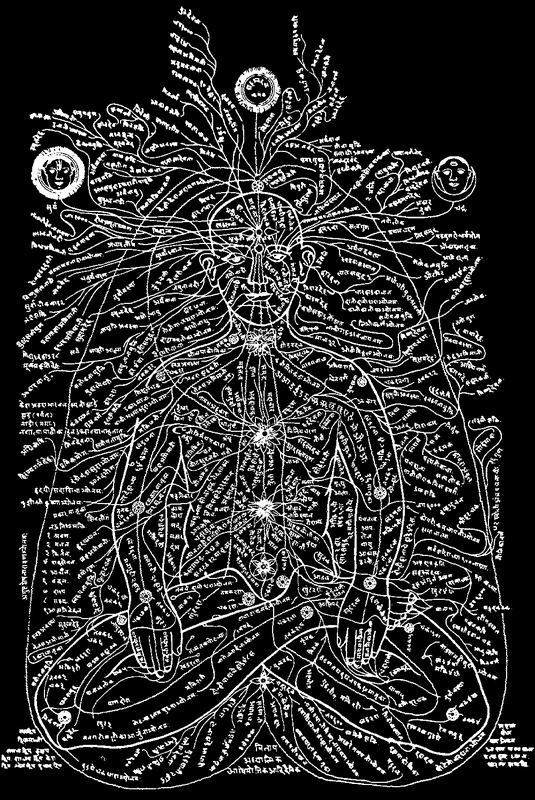 As with acupuncture, we also find here a network of energy currents (Nadis), which are distributed throughout the body, and in which Prana flows. The flow and function of the Nadis are described in detail in the old yoga scriptures (see the picture above) but it is, first of all, used practically in the living yoga tradition. Theoretical studies of scriptures are not sufficient to obtain an experience of this – only those practising the yoga methods will really be able to comprehend what is meant by the old instructions. There are different kinds of methods that influence the energy currents: Asana (yoga poses), Pranayama (breathing exercises), Mudra (attitudes) and Bandha (locks). These are methods which gradually go deeper – from cleansing to control of the energy – and by regular use, they lead to stable health and clear states. When balance is gained through these methods, one can also use more advanced techniques like, for example, Prana Vidya. This is a healing method from the Tantric tradition, where the psychic energy is channelled. The energy is directed to where it is needed – to sick areas in one’s own body or to other people, even at a distance. The principle to heal with energy, albeit in a somewhat coarser form, is also used in medicine. In my time at The German University of Sport in Cologne, sporting injuries, such as strained ligaments and broken legs, were treated by attaching electrodes to the injured parts. They were stimulated with a low voltage current. At a hospital in Syracuse, New York, a low current is similarly sent through the affected areas. Copper thread is wound around, for example, a broken leg and, in this way, the healing process is accelerated considerably. Once you have learnt to apply psychic energy for this purpose, it can be a very powerful and at the same time much more subtle method than those in common use. Energy is life – a different view on humanity? At intensive care units in hospitals, it is possible to maintain a person’s organic life functions almost indefinitely via machines. Today’s discussion of euthanasia shows clearly that we have reached a threshold – when is a person actually alive? As recently as this century, death was declared when the heart had stopped and the breath had ceased. The heartbeat was listened for and the breath was checked with a mirror in front of the nostrils – if the mirror did not mist up, the patient had died. Current European law defines that a human being is alive as long as it is still possible to measure electrical activity in the brain – in other words, as long as there is energy in the body. The heart can temporarily stop, the breath can stop, but only when energy is no longer present, has life left the body. According to our laws, we are beings governed by energy. A discovery which we are only slowly integrating into our world view.